The PBY Catalina and the Boeing B-17 Flying Fortress were the only aircraft with sufficient range to be effective in the Pacific, at the beginning of World War II. 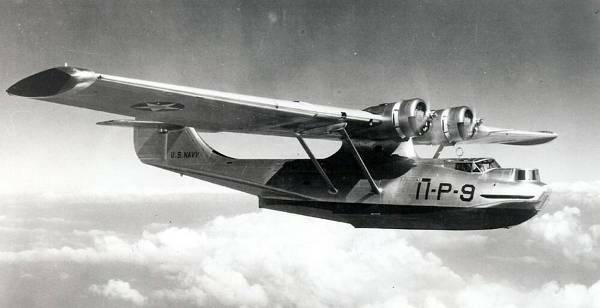 Note that this early PBY does not have the characteristic fuselage blister windows. The Consolidated (Model 28) PBY Catalina was one of the most widely used seaplanes used in the USA and air forces from around the world. It had an extremely long range and was used for reconnaissance, submarine patrol and air sea rescue. There were many notable missions and engagements of the PBY; One PBY searched and found the Japanese fleet of Admiral Isoroku Yamamoto, setting the stage for the Battle of Midway. Flying for the RAF, a Catalina I spotted the Bismark which lead to its being sunk by the Royal Navy. Another PBY rescued 56 sailors in high seas from the heavy cruiser USS Indianapolis after it was sunk during World War II. When there was no more room inside the aircraft, the crew tied sailors to the wings. In October 1933, the US Navy approached the Consolidated and Douglas aircraft companies to submit prototypes for a patrol flying boat with a greater range and carrying capacity than the Consolidated P2Y and Martin P3M which were then in service. Consolidated submitted the XP3Y-1 and Douglas submitted the XP3D-1. Although the Douglas aircraft met all of the US Navy’s requirements, the Consolidated aircraft was selected due to its lower price. Consolidated’s (Model 28) XP3Y-1 two-step hull design was very similar to the P2Y which still featured the high parasol-wing, but gone were the external bracing and wires. The wing was mounted on a pylon above the fuselage and incorporated integral fuel tanks.2 Four external streamlined wing-struts braced the wing from either side of the fuselage. Another novel feature was the introduction of stabilizing floats that retracted to form streamlined wing tips. The cantilever tail was raised midway on the vertical stabilizer creating a cruciform design. All flight controls were fabric covered. It was powered by two 825 hp (615 kW) Pratt & Whitney R-1830-54 Twin Wasp engines mounted midway on the wing leading edges. Armament consisted of four .30 caliber machine guns and provisions to carry 2,000 lb. (907 kg) of bombs. The first squadrons to receive the PBY-1s were VP-11F in October 1936 and VP-12 in early 1937. More orders followed and production progressed to the PBY-2, PBY-3 and PBY-4. The PBY-4 was powered by two 1,050 hp (783 kW) R-1830-72 engines and all but the earliest PBY-4s introduced the characteristic blister windows at the waist positions, replacing the sliding window panel. Production had continued to the PBY-5, but in April 1939, the first production PBY-4 was returned to Consolidated for modifications as an amphibious model. A tricycle landing gear was installed with the nose retracting into the hull and the main landing gear retracting into recesses into the fuselage sides. It was given the designation XPBY-5A and trials showed the design to be a success and a total of 167 PBY-5As were ordered. The first of these aircraft were delivered to VP-83 and VP-91 towards the end of 1941. 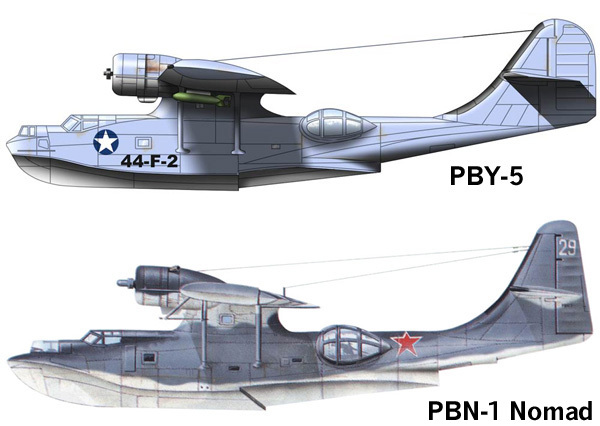 A comparison of the PBY-5 and PBN-1. Note the differences in the nose and tail. 138 of the 156 PBN-1s produced served with the Soviet Navy. The Naval Air Factory (NAF) had undertaken research and development of the PBY and suggested hydrodynamic improvements to the hull. An order was made with the improvements and it was designated as the PBN-1 Nomad. The most obvious differences were to the bow, which was sharpened and extended by two feet and to the tail, which was taller and featured a new shape. Other changes were improved wingtip float lines, increased fuel capacity, stronger wings and a higher gross weight. 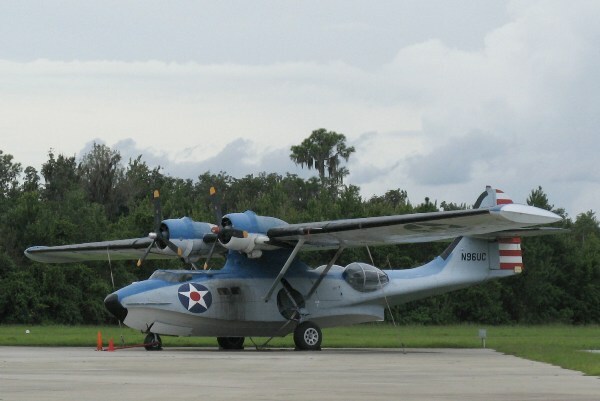 These changes were incorporated to the final production model, the PBY-6A. In 1937, the Soviet Union showed interest in the Catalina which resulted in an order for three aircraft and a license for production. They were designated as the GST and were powered by Mikulin 900-1,000 hp (671-746 kW) M-62 radial engine which was a derivative of the licensed built M-25 Wright Cyclone. The first GSTs appeared in 1939 and production numbers vary from 150 to several hundred. The Soviets also acquired, under Lend-Lease, 137 PNB-1 Nomads, built by the NAF and 48 PBY-6As. 1,200 hp (895 kW) 14 cylinder radial engines. Three .30 caliber machine guns.Two nose and one tunnel gun. Two .50 caliber machine guns. One in each waist position. Provision to carry 4,000 lb. (1,814 kg) bombs or depth chargers. 1. David Mondey. The Concise Guide to American Aircraft of World War II. New York: Smithmark Publishers, 1982. 62. 2. Glenn D. Angle, ed. Aerosphere 1941. New York: Aircraft Publications, 1941. A-30. 3. Howard Mingos, ed. The Aircraft Year Book for 1936. New York: Aeronautical Chamber of Commerce of America, Inc., 1936. 259. Created September 29, 2013. Updated October 13, 2013.